Our current way of living, working and conducting business has created a growing demand for connectivity to mobile networks, an explosion of big data with the Internet of Things, and constant technology innovations. Working in our offices and making our offices work is not excluded from this transformation – with corporate real estate being at the core of not only being an ecosystem of enterprise, but also of multiple global operations, partners, technologies and solutions. Efficiently managing a complex corporate real estate portfolio requires simply connected IT solutions to ensure data consistency in each location, accessible via a user-friendly interface from all over the world. 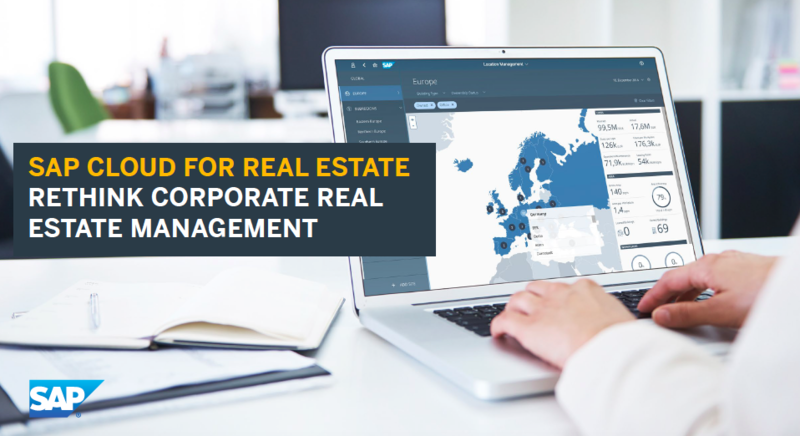 SAP Cloud for Real Estate provides centralized information for an organization’s corporate real estate portfolio. It has strong financial integration, provides analytics, and is easily connected through the cloud to web applications. Built on the SAP Cloud Platform, this solution assists CFOs and corporate real estate managers in answering key questions regarding space utilization, facility costs, portfolio composition, and partner collaboration through a beautiful, customer-grade user experience from anywhere on any device. SAP Cloud for Real Estate currently offers options for Location Management and Contract Management, which can be licensed and used together or separately. The solution was developed at the SAP Innovation Center in Potsdam and co-innovated with major German corporations as well as partners from the start-up scene. Co-Innovation customer BOSCH for instance has been there to ensure user-centric outcome; designing an accurate software for a specific user group. Start-Up LEVERTON from Berlin contributes to efficient handling of contracts and abstraction of leasing contracts tackling new accounting regulations IFRS 16 and US-GAAP ASC 842 through Machine Learning. Munich-based NavVis on the other hand increases the consumer-grade user experience through 3D indoor visualization for simplified navigation and space planning. The combination of established trust advisors and the ideas of bright urban entrepreneurs have enabled the creation and release of a user-centric, simple-to-use solution meeting today’s needs of those, whose job it is to create the best possible work environment for our own jobs. With the help of SAP, corporate real estate managers are now in the cloud, too – and it’s nice up here. On the SAP Store, customers can learn more about the production option and start a 30-day free trial first or easily purchase directly.